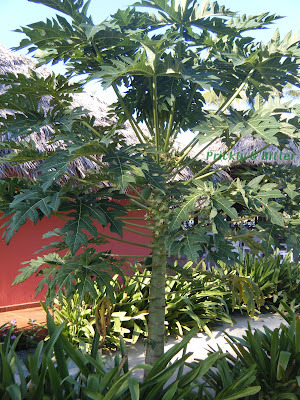 The papaya is native to Mexico where it was cultivated first as an ornamental species, then as a fruit. 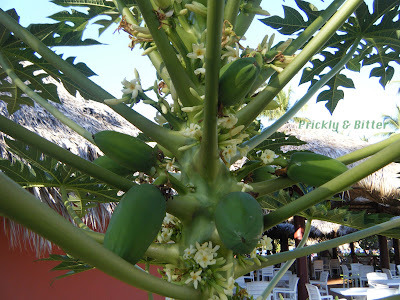 There are logistical problems for the early consumption of papaya as a food crop; I'll mention these issues a bit later in this blog post. Once consumable papayas were developed through traditional breeding about 2,000 years ago, the tree spread throughout the Caribbean and Central America, and it was well established as a fruit crop by the time the Spanish arrived. It was brought back to Spain by Columbus where it was wildly unsuccessful as a fruit tree. It is still widely grown in Central and South America as an ornamental fruit tree, and more often than not decorates hotel grounds and serves as a self-grown crop of fruit at the same time. The papaya is a highly allergenic fruit when it is unripe, and those with sensitive skin may still have problems when the tree is ripe. 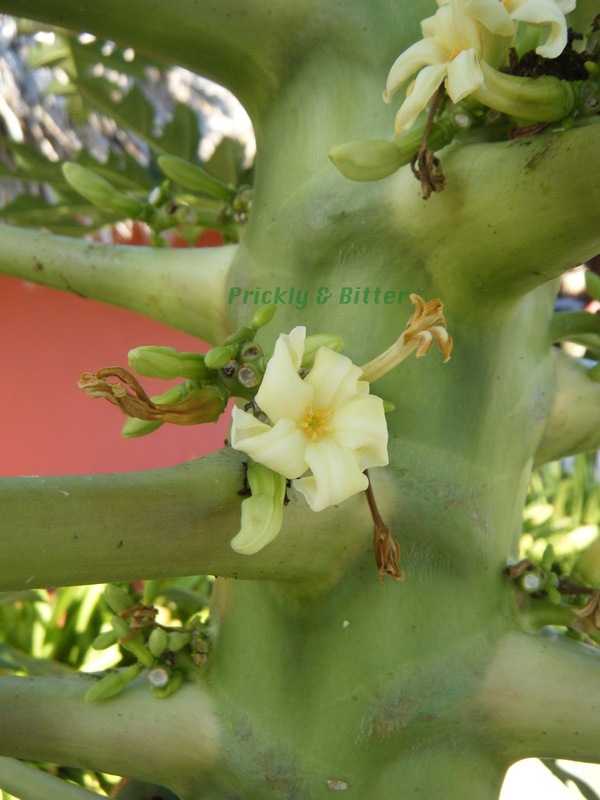 The skin of the fruit (also the petioles or "leaf stalks" of the leaves) contains white milky latexes which are highly irritant when the fruit is unripe and lose their potency as the fruit ripens. This unripe fruit latex isn't just irritating to the skin; chemicals in the latex can be absorbed through the skin and pass into the blood stream where the end result can be uterine contractions that have led to miscarriages. This effect hasn't actually been proven in the literature, but there is enough correlative evidence suggesting this is the case that pregnant women should never consume or prepare raw, unripe papaya. Once the flesh of the fruit turns a yellow-orange and is very soft to the touch, the fruit is fine. Another downside of consumption of large amounts of papaya is a disorder called carotenemia, which is yellowing of the palms and soles of the feet because of the high concentrations of beta-carotene in the fruit (what contributes to its orange-red colour). There is no known health effects from this condition other than rather unsightly hands and feet, and papayas contain significantly less beta-carotene than carrots, a vegetable that contributes to more cases of carotenemia than papayas every year. Should this happen, decreasing the consumption of yellow, orange, and orange-red fruits and vegetables will allow for the gradual re-absorption and use of beta-carotene and the orange colour of the palms and soles of the feet will gradually go away. Given the negative effects that papaya may have, it is actually a fruit that is incredibly healthy. It contains high amounts of vitamin C, B vitamins, lycopene, and quite a bit of dietary fibre for the average fruit. The seeds are also very good for you, containing lots of antibacterial and antifungal compounds that can prevent food poisoning in tropical countries where food is sometimes not prepared or stored according to the same standards as in more northerly countries. Their digestive systems are used to it, but the digestive systems of people living in North America and Europe are more sensitive to the bacteria that may be growing on the food. The seeds can be ground and used exactly as you would use pepper. There is a positive culinary use for the unripe papayas, and that is as a meat tenderizer. The burning feeling you get on your hands if you prepare raw, unripe papayas is actually your skin melting (hopefully you weren't eating while reading this blog post! ); you can exploit that effect by combining green papayas and very tough meat before the cooking process. It breaks down the connective tissue in the meat and usually very tough meat can be prepared to be very tender. 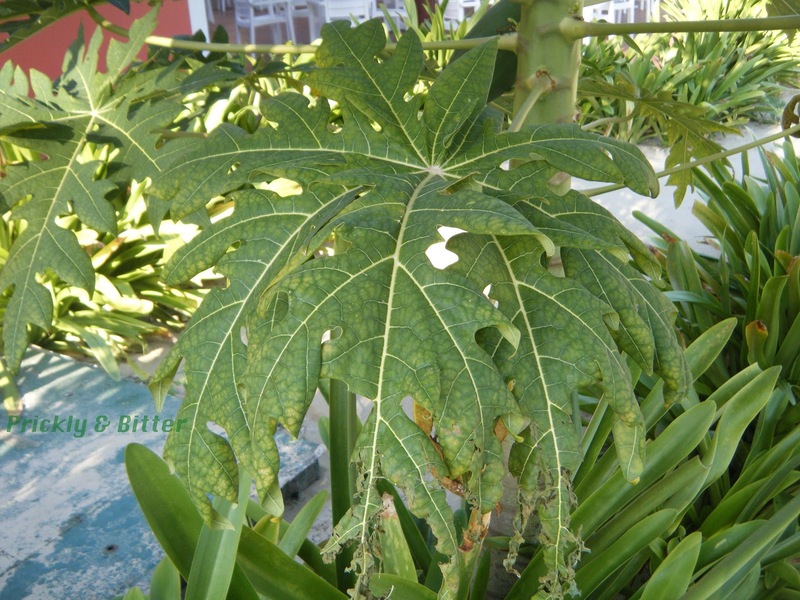 There is also the suggestion that the consumption of papaya leaves in a tea-like preparation can prevent malaria infections, but these claims have never been demonstrated with scientific evidence. Unfortunately, papayas around the world (including this tree I photographed) are being attacked by the papaya ringspot virus, or PRV. On the fruit, this disease causes ringspots that eventually turn into black, squishy circles or blemishes on the fruit. There is no harm in consuming these fruits but they are too unsightly to sell and succumb to other diseases more easily during the shipping process. The leaves of the papaya tree also yellow, curl, and eventually fall off (you can see the beginnings of this in the papaya leaf close-up photo I took; between the veins of the leaf the tissue is much more yellow than anywhere else, and the ends of the lobes of the leaf are starting to decay). This leads to a decrease in productivity of the tree, and eventually the death of the tree. Fortunately, there is a way to create genetically modified trees that already contain some of the DNA of PRV, and this confers resistance in every tree it has ever been tried with. This genetic modification is so successful that now 100% of all papaya trees grown commercially for fruit production contain this modification.